The Detroit Lions continue their solid drafting since getting rid of clueless GM Matt Millen. When Nick Fairley, the defensive tackle from Auburn started falling in the draft, I’m sure Lions head coach Jim Schwartz started having visions in his head of playing the nasty and disruptive DT next to his nasty and disruptive DT Ndamukong Suh. Those two have the potential of being the best DT pairing in the league. 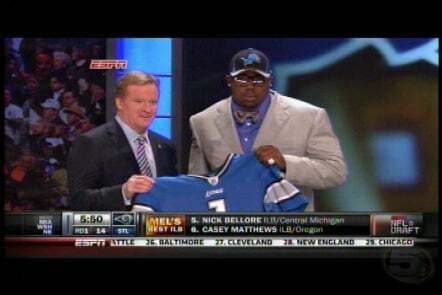 I’m sure current Lions GM Martin Mayhew never imagined Fairley falling to 13 when his draft board started taking shape. Fairley was being talked about as being one of the top players taken if not the top guy, before the buzz started up around his Auburn teammate Cam Newton. Fairley saw his stock fall due to some character concerns. Some have called him a dirty player and some question his work ethic as he’s a little soft around the middle. But his talent far out weighs the potential bust factor. And as far as the dirty player accusations. Who cares. He’s a lineman. I like ’em to play with a mean streak, if he’s borderline dirty then so be it. Having that kind of reputation has a way of getting into the heads of offensive linemen. And any edge you can get in the trenches the better.